Before Kelly and I travelled to Tasmania for a month in February 2008, we did a lot of research to try to ascertain where we could do some shore dives to accompany the boat dives we had planned to do. As a result, I found a book on Tasmanian dive sites but soon realised that there were very few shore dives in the State. This is because along most of the coastline that is easily accessible, the reef adjacent to the rock platform is only a few metres wide and drops to sand in less than a couple of metres. As keen divers would be aware, this is less than desirable. Unlike Sydney where you can get to almost 30 metres on a shore dive (Mahon Pool for example) and you can get to almost 20 metres inside Botany Bay and over 25 metres inside Sydney Harbour, very few places in Tasmania get to more than a metre or two. The book contained a few possibilities that sounded interesting to me (I had counted out all the ones that only got to three or four metres). Of these, once we got to the site the obvious lack of reef when viewed from the surface meant that we did not even bother trying. We also found on the Internet a brochure called Tasmania's Dive Trail which, to be honest, is not worth the pixels it is screened on. It claims that there is good shore diving at a number of places (eg Bruny Island) but we never found any site that had a reef that extended more than a metre or two below the surface of the water. 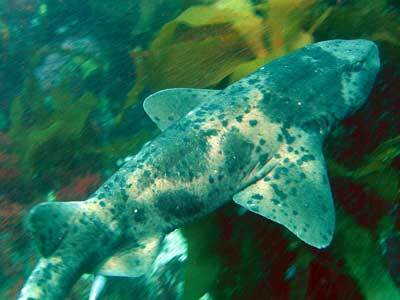 Anyway, on the trip we only found three spots that looked worthwhile to shore dive. One of these was at Bicheno. 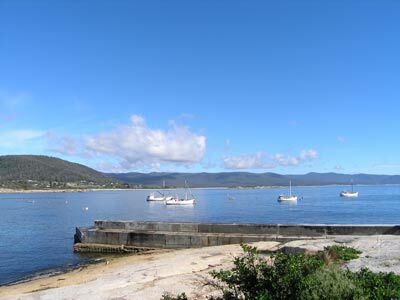 Bicheno is located about 177 kilometres north-east of Hobart and is one of the nicest places in Tasmania. 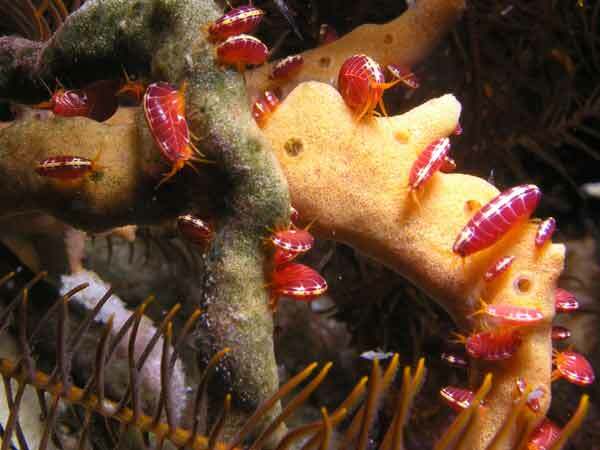 There are some fantastic boat dive sites here, but there are also a few shore dives. One of these is called Waubs Bay (or just The Bay). Waubs Bay is the main by on the western side of the town. To find the site, drive to the main intersection with the highway and head north along the road that is adjacent to the park. This is called Burgess Street. As you travel past the park on your right and left, take the next street to your left. This leads to the old harbour area. Park as close to the concrete breakwater as you can. The dive starts on the inside of the breakwater and heads out to the north-west under some of the boats that you will see anchored. On a clear day, you can actually see the edge of the reef. After gearing up, walk to the water's edge adjacent to the breakwater. There is an excellent entry and exit point here, with the rock sloping quite nicely to make it easy to get back ashore. Once in the water, swim out a little way before descending. Once on the bottom, head south till you reach the sand edge. Follow this edge to the west and north-west. On your right the bottom is rocky reef with a lot of kelp. 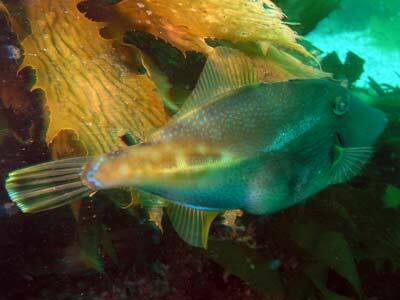 As in all of Tasmania, the kelp is quite large and the leaves very broad. 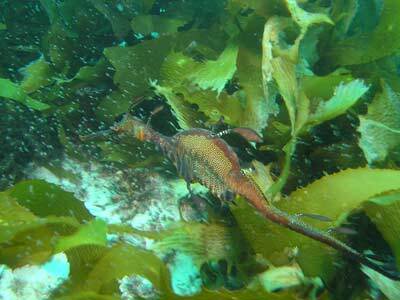 As you go along, look for sea dragons on the sand and among the kelp. The ones we saw are darker in colour than the ones seen in New South Wales. Also look under the kelp for sea horses. There are pot belly sea horses resident in this area. 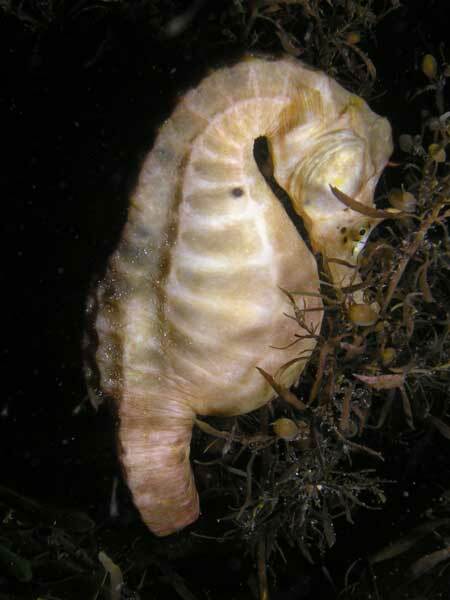 These pot belly sea horses are huge, much bigger than the big belly sea horses we get in Sydney at Bare Island. They look very similar and whereas ours are about 150 mm long, the ones here are well over 200 mm long. They really look like they are on steroids! 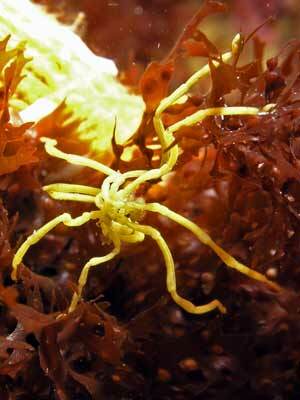 The ones we found were a bright yellow with black spots. They also have spikes on their heads. As you go the depth gradually increases from seven metres to over 15 metres. Along the sand edge keep an eye open for small rays (some with Port Jackson shark type markings). We saw a huge bullray as well as some eagle rays. 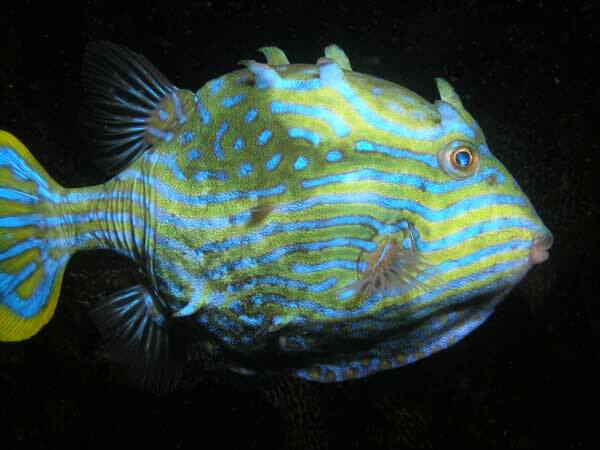 We also saw cowfish, squid, yellow sea spiders, long-snouted boarfish, large schools of trevally and bream. At 10 metres there is the first of two smaller bommies. At 13 metres you will see the second one and at 15 metres is The Rock. This is a very large bommie that has a split in it. The fishlife is amazing in and around this bommie. Just past here is about as far as you will get so turn around near here, depending on your air consumption. 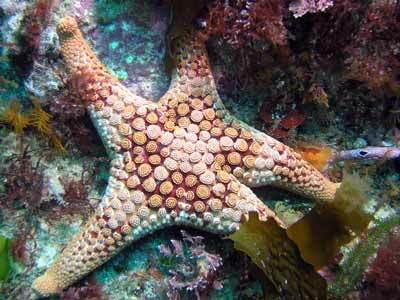 There were also a few cuttlefish, more squid, a blind shark (or similar), lots of starfish and more. There were also a lot of nice sponges on the bommies. 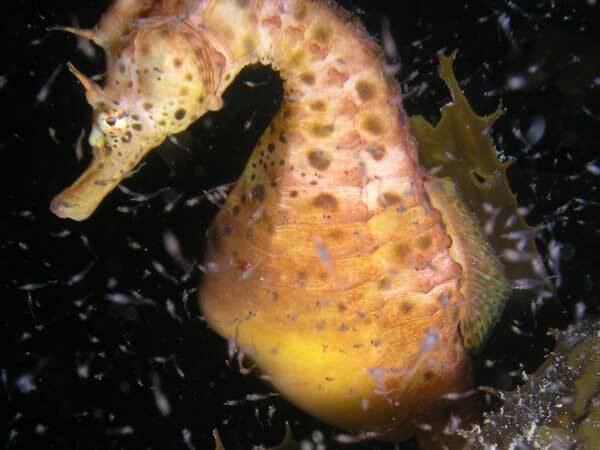 On the way back, look for sea horses under the kelp, you should be able to see a couple. Also look on the sides of the bommie, we found one here. You should be able to spend at least one hour on this dive, there is certainly enough to keep you interested for that long and more. What an excellent dive site! 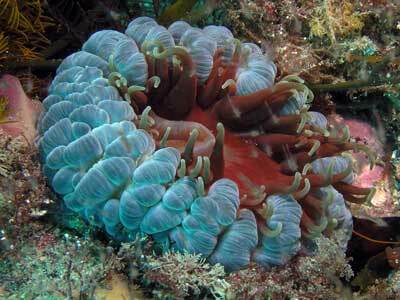 One of the best shore dives you will do anywhere in Australia. Visibility in February 2008 was at least 10 metres (and this was after a few days of big seas) and water temperature was 17.2ºC. In February 2009 I did this dive again, this time as a night dive. We did exactly the same as the dive described above but only got as far as the second bommie. 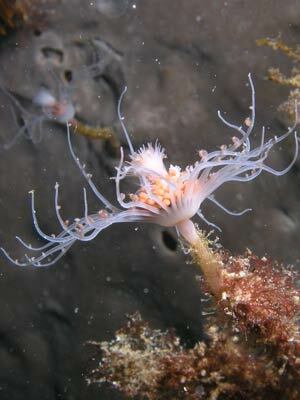 All the photographs below are from the night dive. 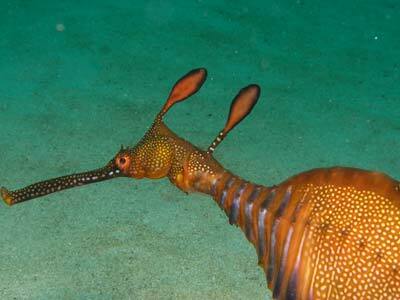 On this dive there were three big belly sea horses, numerous Shaws cowfish, both male and female, at least 10 sea dragons, all carrying eggs. Most were also covered in algae. There were lots of other things to see, including red sea fleas (my description) and a huge bullray near the exit. This is an excellent night dive, I only exited the water at an hour because I was starving and dinner was waiting. I recommend the services of Bicheno Dive Centre for air fills when in this area, it is a great dive operation.